Prepare a perfect afternoon tea with our Royal Victoria bone china teapot. The teapots engaging design is inspired by some of Queen Victoria's most iconic symbols, that of one of her most noticeable crowns (which can be seen at the Tower of London) and the Honiton lace wedding flounce she wore at her wedding. The teapot measures 16cm x 16cm and makes a captivating centrepiece for a perfect English tea party all through the year. Made from bone china in the United Kingdom. Enjoy afternoon tea in elegance with our captivating Royal Victoria bone china teapot. The teapot is made in the UK from bone china and features an exclusive design which is inspired by Queen Victoria's petite crown and the designs from her Honiton lace wedding dress. 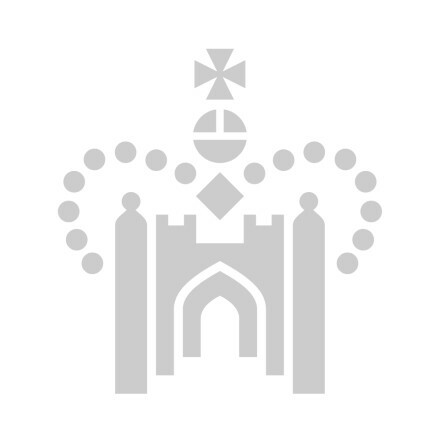 The crown became a well known symbol associated with Queen Victoria as it was specially designed for her mourning wear following the death of Prince Albert. The crown featured 187 diamonds but was lightweight and small enough to fit above her veil. Made in the UK and comes complete with it's own gift box. Teapot measures 16cm x 16cm x 16cm. The teapot should not be placed in a dishwasher or microwave.